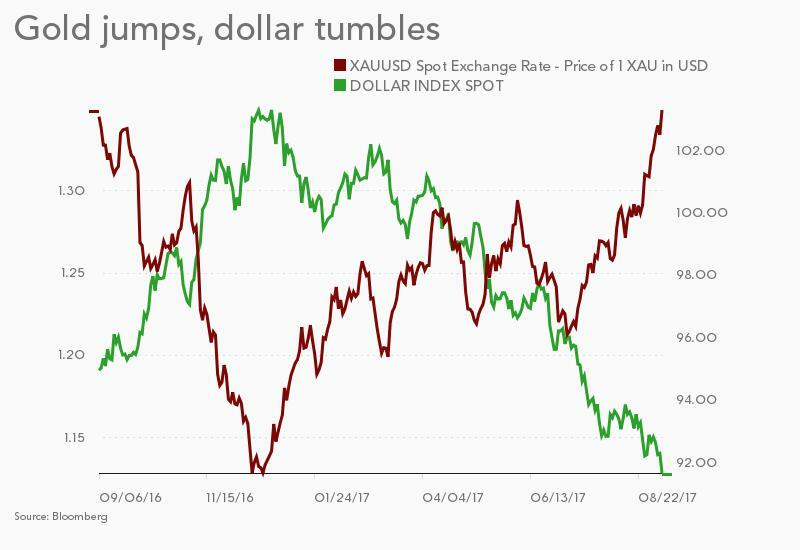 On Thursday, gold's status as a hedge against uncertainty were burnished again as investors worried about impact of storms in the US and escalating geopolitical tensions marked down the dollar. Gold futures in New York for delivery in December, the most active contract, ended at $1,354.00 an ounce, up more than 1% compared to Wednesday's closing price and not far off its highs for the day. Gold is now up 17.6% or over $200 so far in 2017. Gold's rally from it's summer lows was given fresh impetus from a sharp fall in the US dollar on Thursday. A decision to hold rates in Europe, disappointing US job numbers combined with mounting costs for damages from hurricane Harvey and the possible devastating effect of approaching storm saw the greenback trade at its lowest level against the country's major trading partners since January 2015. “Investors don’t want to go into the weekend when North Korea is scheduled to show its military prowess during the Founders day celebration without their hedges in place,” Quincy Krosby, chief market strategist at Prudential Financial told MarketWatch. Gold's leg up saw major gold mining stocks enjoying another positive day of trading. 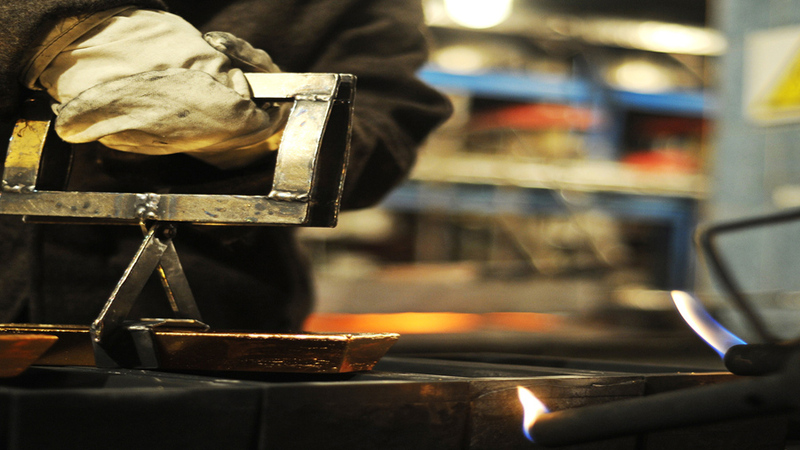 World number two producer Newmont with output of 5m ounces expected this year, was one of the best performers of the day with the Denver-based company rising 3.2% in New York. With a $21.1 billion market cap Newmont is now worth more than top producer Barrick Gold. The Toronto-based company has shrunk its portfolio of mines and this year is predicting between 5.3–5.6m ounces of gold production, down from a peak of 7.7m ounces six years ago. Goldcorp added 2.5% for a market cap of $12 billion, but the Vancouver-based miner's advance so far this year has been modest as just over 4%. The third largest gold miner in terms of output, AngloGold Ashanti trading in New York leaped 4.9% pushing the company back into positive territory for the year. Fellow South Africa-based producer Sibanye fresh off a $2 billion acquisition of a North American platinum producer and a name change was the odd one out with a decline on the day, but Harmony Gold and Gold Fields advanced with the latter now sporting year-to-date gains of 55%. Africa-focused Randgold Resources added 3.8% lifting the company's market value on the Nasdaq to above $10 billion and year to date gains to above 40%. Toronto's Kinross Gold climbed 4.5% pushing its market value above $6 billion. The Canadian miner with four mines in the US, a couple in Russia and operations in Brazil and West Africa is now up more than 47% in 2017. Other Canadian gold companies also performed well with Agnico Eagle up 1.6%, Yamana Gold adding 1.8% and Eldorado Gold gaining 1.6% .